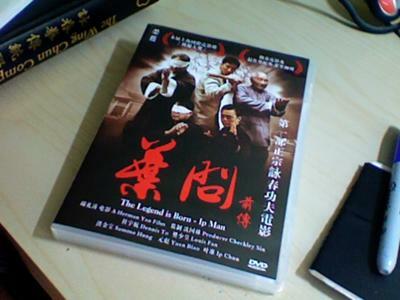 Wing Chun Movie DVD: "The Legend is Born - Ip Man"
In the movie "the legend is born", the Chi Sau that Sammo Hung does is different. Why is that? Answer: Wing Chun is a rich and diverse martial art with over 250 years of history. Like many things in life it migrated geographically and evolved with each new generation of sifu. (Just think how many different kinds of spoken "English" there are in the wold). Even within the Ip Man lineage of Wing Chun his students developed slightly different styles for Chi Sau and Wing Chun forms. When you look outside the Ip Man lineage the differences can be quiet a bit more drastic. 1) It's a movie and they have to make it look and work better for the camera and the story. 2) The on-site Wing Chun adviser is from a different lineage than what you study. 3) It's a movie and the actors where just "playing" Chi Sau but don't really know it or didn't have enough time to really learn good Chi Sau. In any case, I really liked "the legend is born", even though I also found the Chi Sau weird looking. If you're curious about the different variations of Wing Chun, check out Complete Wing Chun by Robert Chu, Rene Ritchie, & Y. Wu. It's an excellent guide to Wing Chun's history and traditions. I borrowed a copy of that book from a friend and it has a great collection of the non-Ip Man lineages. I'm re-reading and taking notes this time around. i also have a copy of Complete Wing Chun by Robert Chu, Rene Ritchie, Y. Wu. so far is the best literature on the diferent lineages of WC. Also, it can probably be agreed that the two most common ways of Chi Sau are the Hong Kong (Ip Man) way and the Guandong way from Guangzhou(Yuen Kay-San). the former of course being the familiar bong sau/taan sau, fook sau, and the latter being the circular way, with the fook sau snakes and slips around the partners'. Still, ive heard different instructors tell their students that the way is not important, as long as your body structure is correct, the forward intent is there, and the end result is the ability of touch reflex (rather than sight reflex),and to take the opponents' balance and overcome his technique. Thanks for your comparison between the two most common forms of chi sau structure. I'd like to add one more distinction with the Hong Kong style as you label it (bong, tan, fook). One of its important benefits is it pretty much closes off the centerline. That's what you train in this form of chi sau more than anything - closing your centerline while opening your opponents center. Some say that it is very defensive for this reason, and I'd say that's true. Nothing wrong with keeping your guard up.